Why We Get Old: Programmed to die? If you're alive in 20 years, you may be able to live forever. In 1786, average life expectancy was just 24 years. A hundred years later (1886) it doubled to 48. Right now a newborn can expect to live an average of 76 years. With recent discoveries in biology, many scientists predict that life expectancy will continue to triple-digits. In fact, if they are correct, humans shouldn't have to die at all in the future. "Over half the baby boomers here in America are going to see their hundredth birthday and beyond in excellent health. We're looking at life spans for the baby boomers and the generation after the baby boomers of 120 to 150 years of age." -- Dr. Ronald Klatz of the American Academy of Anti-Aging. Today's quest for the fountain of youth is taking scientists inside the genetic structure of cells and paying less attention to the role of stress and diet on life spans. Would-be immortals flock to anti-aging clinics and shell out as much as $20,000 a year for treatments that include hormone therapy, DNA analysis, even anti-aging cosmetic surgery. These experimental therapies offer no guarantees of immortality -- just the promise of prolonging life. "Anti-aging medicine is not about stretching out the last years of life. It's about stretching out the middle years of life... and actually compressing those last years few years of life so that diseases of aging happen very, very late in the life cycle, just before death, or don't happen at all." -- Dr. Klatz. Why do we age and die? The cause of what we call "aging" is now being understood. This new understanding may soon move anti-aging cosmetics and surgery to the ranks of snake oil and Siberian yogurt as life-extension fads -- but not yet. There are a few obstacles that need to be addressed. Just when you thought that holographic TV and outer space travel were on the future horizon of modern technology, immortality has silently been revealing itself to scientists like Doctor John Langmore [right] of the University of Michigan's Department of Biology. Dr. Langmore and his group looked inside human cells, at the very essence of human life: the DNA molecule. Specifically, Dr. Langmore looked at the tips of the DNA molecule -- a previously overlooked part of the double-helix molecule -- that contain a kind of chain of repeating pairs of enzymes. Called telomeres, these molecular chains have often been compared to the blank leaders on film and recording tape. Indeed, telomeres seem to perform a similar function. During the replication process the spiral DNA molecule must split in half and reassemble a copy of itself. Protecting the vital DNA molecule from being copied out of synch, telomeres provide a kind of buffer zone where mis-alignments (which are inevitable) will not result in any of the important DNA code being lost. Perhaps the best analogy I have heard is to compare the telomeres to the white margin surrounding an important type written document. In this analogy, the printed text is the vital DNA code while the white space is the "blank" telomeres. Imagine that this paper is repeatedly slapped on a copy machine, a copy is made, and then that copy is used to make another copy. Each time the paper is subject to errors of alignment and these errors accumulate. After enough copying, it is probable that the white space will diminish and some of the actual text will not be copied. That's what happens inside our cells and it is the reason we get old and die. As any cell gets older, it is under attack by oxides and free-radicals in the body and environment. We survive as living beings because our cells have the ability to duplicate and replace themselves before being killed by these natural causes. Each time our cells divide, the DNA molecule makes a new copy of itself. But the procedure is very complex and not perfect. Usually a small portion of the DNA molecule is lost, misaligned and not copied. Since errors are more frequent on the ends of the DNA molecule, this area, the telomere, does not contain any important DNA information and the effect is insignificant. Telomeres -- programmed to die! Scientists observe that the length of telomere chains becomes shorter as we grow older. Eventually the telomeres become so short that cell replication produces lethal errors or missing pieces in the DNA sequence, ending the cell's ability to replace itself. This point, when the cell has lost vital DNA code and cannot reproduce, is called the Hayflick limit. It's the measure of how many times a cell can copy itself before it dies. Some cells in our body have a very high hayflick limit. Cells that line the inside of your mouth and intestines, for example, are constantly being worn away and replaced. Indeed these cells appear to have the ability to regrow telomeres even in aged bodies. Scientists were curious why some cells shut down telomere growth with age, and some do not. Dr. Langmore used physical, biochemical, and genetic techniques to study the structure and function of telomeres. His group developed a cell-free system to reconstitute functional model telomeres using synthetic DNA, and studied the mechanism by which telomeres normally stabilize chromosomes and how shortening of the telomeres could cause instability. The protein factors responsible for stabilizing the ends of chromosomes are being identified, cloned, and studied. Electron microscopy is used to directly visualize the structure of the model telomeres. Dr. Langmore's group used new enzymatic assays to determine the structure of telomere DNA in normal and abnormal cells grown in vivo and in vitro, in order to address specific hypotheses about the role of telomeres in aging and cancer. It's exciting research, for sure, and there have been some promising discoveries. Scientists have discovered an important enzyme that can turn the telomere production on the DNA molecule "on" and "off." It's called telomerase. Not surprisingly, it seems that as we get older, the amount of telomerase in our cells decreases. You might be wondering why biologists don't simply find a way to keep our body's telomeres long. This would prevent replication errors and humans could live indefinitely. The big problem is cancer. Usually, if a cell makes an error in copying itself, the error will prevent the cell from duplicating itself in the future. So the mistake is limited. But with cancer, cells with errors somehow "turn on" the production of telomerase and make the mutant cell immortal. Now, aberrant cells can reproduce unchecked and outlive normal cells. This is the process that creates tumors. Since we all have mutant, pre-cancerous cells in our bodies, nature has decided to shut off the telomerase as we age, thus preventing these mutant cells from growing telomeres. It's a kind of programmed death -- a trade off to reduce our lifespan in order to save us from being riddled with tumors. Nevertheless, some pre-cancerous cells manage to re-activate their telomeres and this has caused the research to focus more on blocking telomere production rather than trying to extend it. [Right: A 3-d rendering of the telomerase enzyme.] 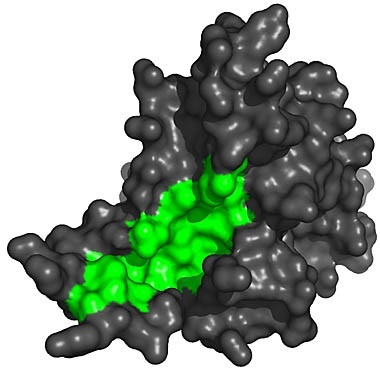 The molecular structure shows an interesting "groove" (show in green) where the enzyme attaches to the end of the DNA molecule. Telomeres are special, essential DNA sequences at both ends of each chromosome. Each time chromosomes replicate a small amount of the DNA at both ends is lost, by an uncertain mechanism. Because human telomeres shorten at a much faster rate than many lower organisms, we speculate that this telomere shortening probably has a beneficial effect for humans, namely mortality. The telomere hypothesis of aging postulates that as the telomeres naturally shorten during the lifetime of an individual, a signal or set of signals is given to the cells to cause the cells to cease growing (senesce). At birth, human telomeres are about 10,000 base pairs long, but by 100 years of age this has been reduced to about 5,000 base pairs. Telomerase is actually an enzyme (a catalytic protein) that is able to arrest or reverse this shortening process. Normally, telomerase is only used to increase the length of telomeres during the formation of sperm and perhaps eggs, thus ensuring that our offspring inherit long "young" telomeres to propagate the species. ViewZone: How is mortality in non-germ line cells a beneficial effect? Dr. Langmore: The telomere hypothesis of cancer is that the function of telomere shortening is to cause cells that have lost normal control over growth to senesce (i.e. stop growing) before being able to replicate enough times to become a tumor, thus decreasing the frequency of cancer. Immortal cells like cancer have an unfair advantage over normal human cells which are designed to senesce. But nature seems to have planned this human telomere shortening perhaps to prolong life by hindering the otherwise unchecked growth of non-immortal or benign tumors. Malignant, or immortal tumors can simply outlive the rest of the organism. Malignant cancer cells are being studied because they appear to have altered the shortening of telomeres by turning "on" the telomerase. Thus it appears that some cancers and aging are both connected with the biology of telomeres. It is possible that increasing telomerase activity in normal cells might stop the biological clock of aging, yet the side effect of this intervention might be an increase in the rate of cancer. Further understanding and refinement in the telomere hypothesis might lead to a way to slow the aging process and prevent or arrest cancer. However telomeres function, they are an integral part in the very complex process of cell growth, involving many other factors as well. Telomerase might be the Achilles Heal of aging and cancer, but as our understanding of factors that interact with telomerase, factors that are responsible for telomere shortening in the first place, and non-telomerase mechanisms for increasing the length of telomeres, we might find that one of these factors is more easily manipulated to slow aging or prevent cancer. Also there are additional factors that affect aging and cancer, which might prove in the end to be more important than telomeres and telomerase. ViewZone: Are telomeres unique to individual DNA? If so, does this preclude any universal treatment for aging? Dr. Langmore: Different individuals have telomeres with exactly the same DNA sequence but of different lengths. It is too early to say whether there is any relationship between telomere length in an individual and his or her life expectancy, or whether a treatment that would artificially lengthen telomeres would arrest (or reverse) the aging process. One problem is that even in one individual the telomeres of different chromosomes have very different lengths. Therefore an individual might have on average long telomeres; but, he might have one chromosome with a very short telomere that could affect cell growth. ViewZone: In the work of Shay and Wright (see below), increased telomere length was positively associated with telomerase. How significant is this? Dr. Langmore: Shay, Wright and all their many collaborators stimulated telomerase activity in normal cells. This was expected to 1) Increase the length of telomeres and 2) Prolong the lifetime of the cells in tissue culture. The treatment did both, in perfect agreement with the telomere hypothesis of aging. ViewZone: How much was cell lifetime prolonged due to this treatment that reactivated telomerase? Dr. Langmore: The increased proliferation of the cells was perhaps equivalent to hundreds of years of human life. Dr. Langmore received his Ph.D. degree from the University of Chicago in 1975. He has held postdoctoral fellowships at the Laboratory of Molecular Biology in Cambridge and at the University of Basel. [Above:] One of the more surprising developments in telomere structure was the discovery by collaborative efforts from Jack Griffith's and Titia de Lange's groups that mammalian telomeres looped back on themselves to form large lariat-like structures, called t-loops (Griffith et al., 1999). In the March 15 issue of the European Molecular Biology Organization (EMBO) Journal, Dr. Jerry Shay and Dr. Woodring Wright, both professors of cell biology and neuroscience at UT Southwestern Medical Center at Dallas, report manipulating the length of telomeres to alter the life span of human cells. Shay and Wright are the first to report this important finding. They received an Allied-Signal Award for Research on Aging to explore this line of research last year. "By lengthening the telomere, we were able to extend the life of the cell hybrids," Wright explained. "This study is strong evidence that telomere length is the clock that counts cell divisions." "The expression of the enzyme telomerase maintains stable telomere length. Telomerase is not detected in normal cells and telomeres shorten and then the cells stop dividing and enter a phase called cellular senescence." Shay and Wright have shown in earlier studies that telomeres maintain their length in almost all human cancer cell lines. This correlated with inappropriate expression of telomerase and as a consequence allowed the cell to become "immortal." Cell immortality is a critical and perhaps rate-limiting step for almost all cancers to progress. Previous work by the UT Southwestern investigators showed that in a special group of advanced pediatric cancers the lack of telomerase activity correlated with critically shortened telomeres and cancer remission. Naturally, the exploration of this enzyme is now the focus of much investigation, but for now the research is aimed at understanding how to turn telomeres "off" to limit the spread of "immortal" cancer cells. Abnormally high levels of telomerase have been found in cancerous breast cells and have been evident in many kinds of tumors. Consequently, an idea gaining momentum is that the ability to measure and perhaps alter telomere length and/or telomerase activity may give physicians new diagnostic and treatment tools for managing the care of patients with cancer. Shay and Wright tried to alter already-immortal cells by attempting to inhibit telomerase activity and cause telomeres to shorten. "Unexpectedly, we found the opposite result. Rather than inhibiting telomerase, our treatment caused the immortal cells to develop longer telomeres," Shay explained. "Although we were surprised with the result, we now know there is a causal relationship between telomere length and the proliferate capacity of cells. "Essentially, we combined the tumor cells containing experimentally elongated telomeres with normal cells and extended the life span of those cell hybrids compared to similar hybrids using cells without experimentally elongated telomeres." Shay and Wright said the mechanism that causes telomeres to lengthen is still unclear. However, Shay said, "Our observations increase confidence in the hypothesis that immortal cells and reactivated telomerase are essential components of human tumors. Ultimately, we may be able to regulate tumor cells by inhibiting telomerase activity." NEXT -- A New Player: Progerin?